In this hub I'll be showing you how to upgrade the hard drive in the Dell Alienware M15x laptop. Why should you upgrade your hard drive? Upgrading the hard drive is a great way to add more storage space to your laptop for applications, videos, or photos. You can also increase the speed of your computer by installing a sold state drive. Sold state drives are incredibly fast, quiet, and cool since they do not rely on moving parts. Having this job done by a professional could cost between $100 to $150 just in labor, so doing it yourself is a good way to save some cash. 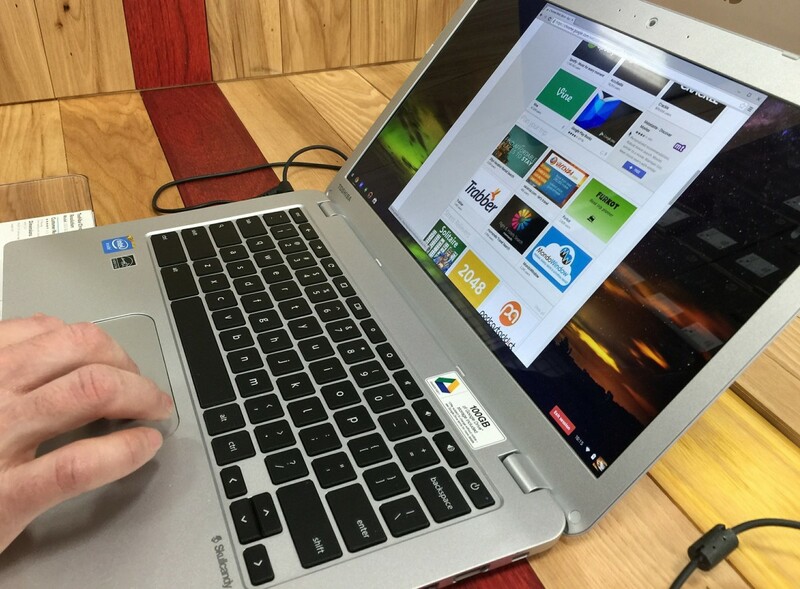 Even if you have never opened your computer before you can easily complete this upgrade in 30 minutes using the instructions on this hub. Since you'll have the computer opened up you might want to consider doing a memory upgrade at the same time. For this upgrade you will need the following items. 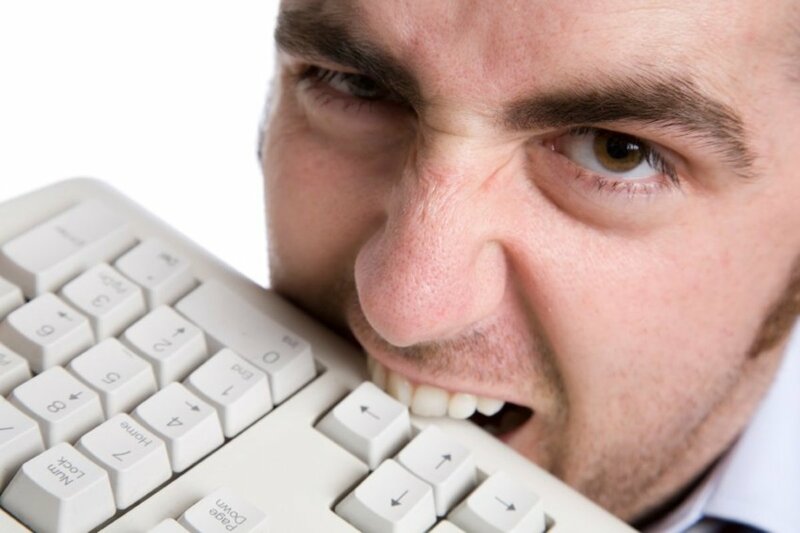 It's always a good idea to backup any critical files on your computer before you do any work on it. If done properly this is a very safe upgrade but there is always a chance that something unexpected might happen. Since your new hard drive will be blank you will either need to clone your existing operating system to the new drive before doing the upgrade or reload the operating system yourself both of which are outside of the scope of this hub. Intel offers their data migration software for free which can easily help you clone your drive onto a new Intel solid state disk. It's important to use the right tools for the job, using a screw driver that is too big or too small can easily strip the screws. 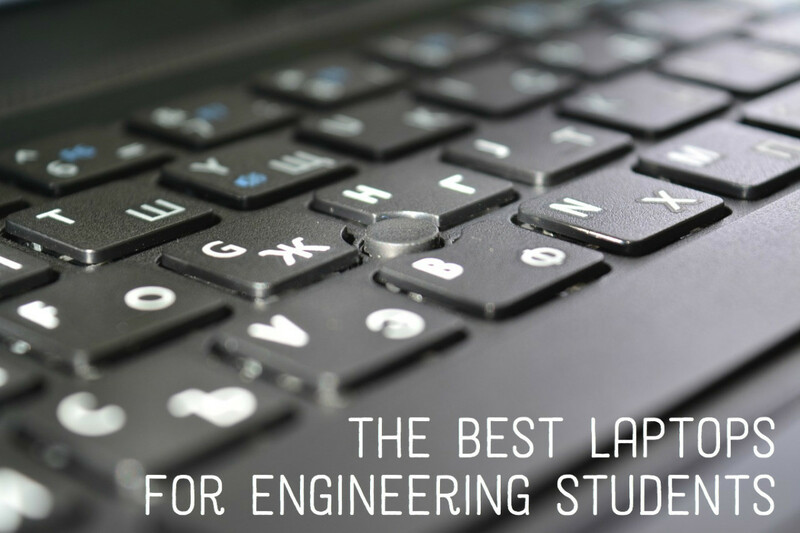 Locate a clean, flat work surface to place the laptop on. 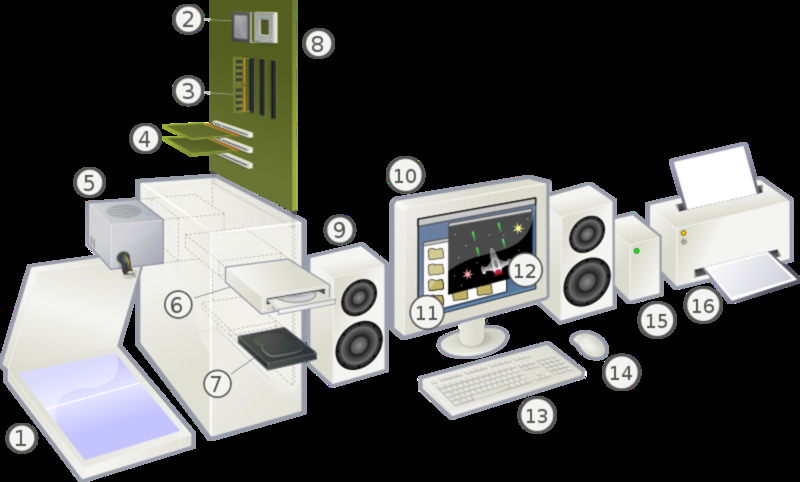 Placing it on the carpet creates a risk of static damage to the internal components. Make sure the laptop is powered off and disconnect the AC adapter. 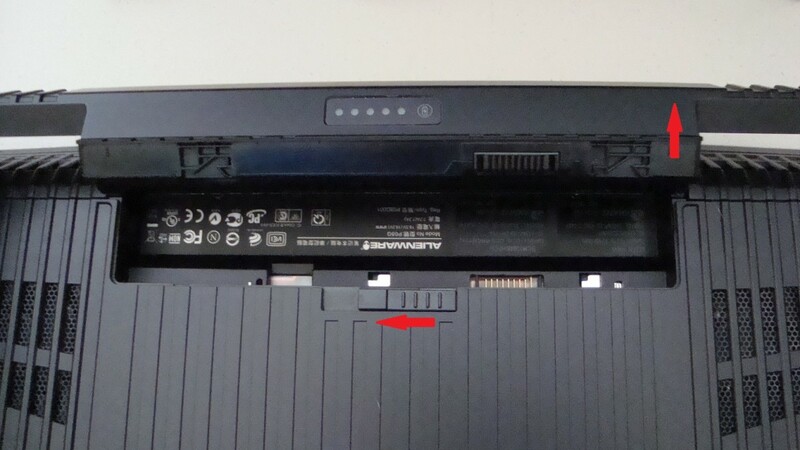 Turn the laptop upside down and locate the battery release switch. 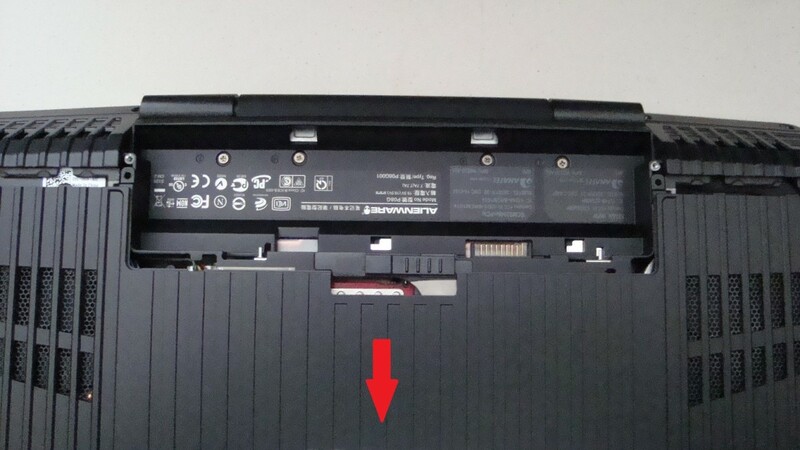 The switch is located just below the battery compartment as shown in the picture below. While holding the release lever to the left gently tilt the battery upwards and it should come right out. Next you'll need to remove the two screws that attach the rear compartment door. 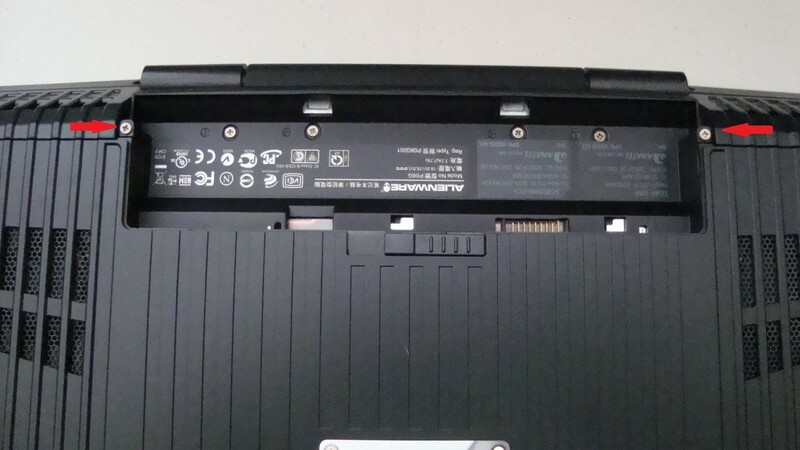 There is one screw on the upper left side of the battery compartment and one on the upper right side. After removing the two screws slide the rear compartment cover downwards away from the battery compartment. You'll need to use slight pressure to firmly slide the cover away. The hard drive is located near the front of the laptop. Loosen the four screws which secure the hard drive into place. Once the screws do not come out any further they are as far out as they will go. This is a nice feature to keep you from losing the screws. After loosening the screws gently pull up on the pull tab, the drive will lift off of the connector and out of the laptop. Next remove the four screws (two on each side) which secure the hard drive to the caddy. Take note of the orientation of the current drive, the replacement one will need to be installed in the same way. After the drive has been removed from the caddy remove the interposer connector from the end of the drive. In the picture below I have shown the interposer partially removed. Use a flat head screwdriver on the left and right side to slide the interposer off of the drive. Insert the interposer board onto the new hard drive, it will only fit one way so don't force it. Install the drive in the caddy and replace the four screws to secure it into place. The end of the hard drive with the connector should face towards the black pull tab. I've decided to install the Intel X25-M 160GB hard drive into my laptop. 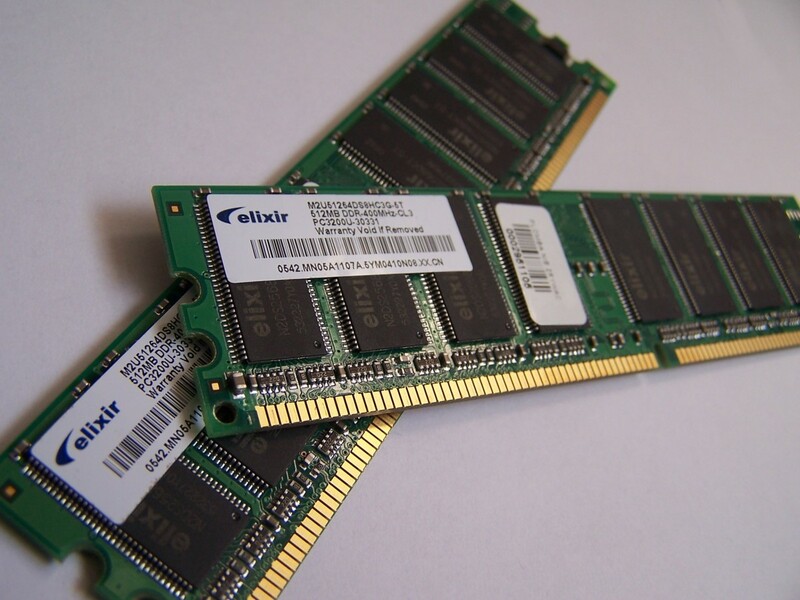 Solid state drives can increase the speed of your laptop, make the battery last longer, and make it run cooler. 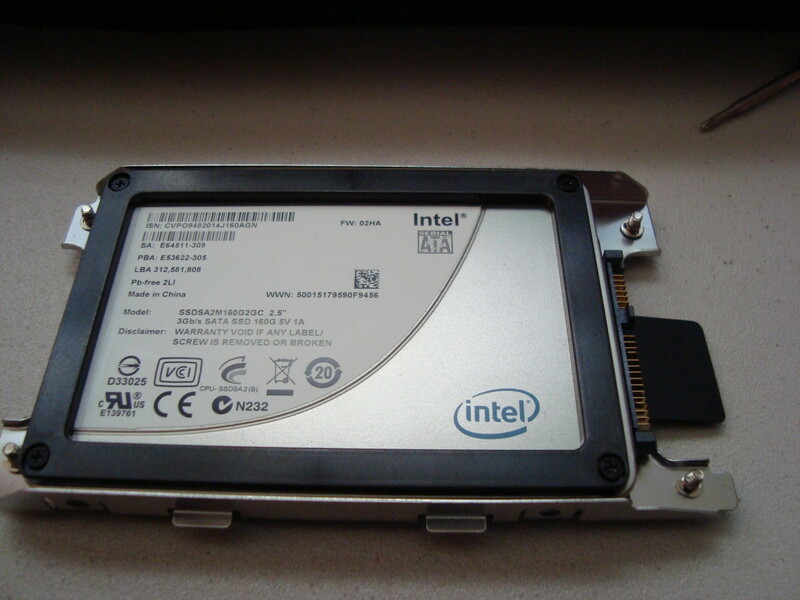 Intel also offers a 80GB, or 120GB version of this same drive. 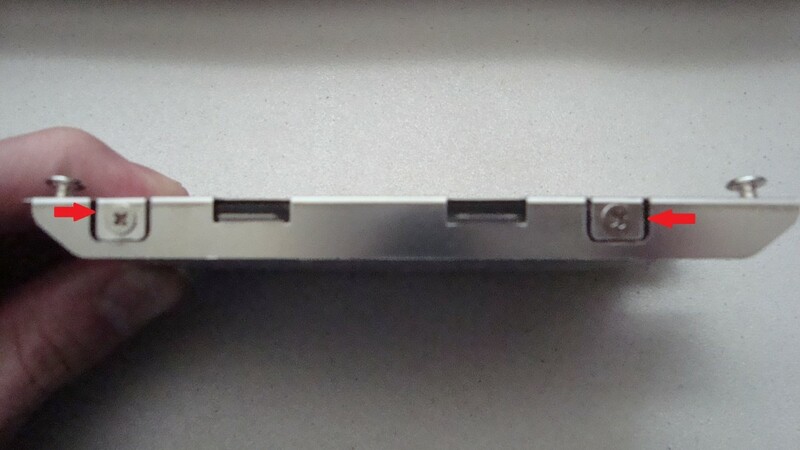 To install the drive and caddy back into the laptop insert the rear of the caddy into the compartment and gently set the front down onto the connector. Take your time and be sure the connector is lined up properly before you press down to seat it. 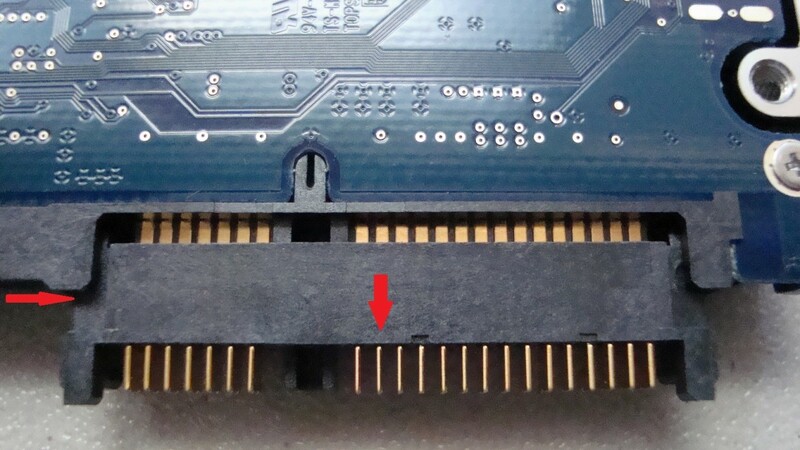 You do not want to bend the pins on the interposer or connector! 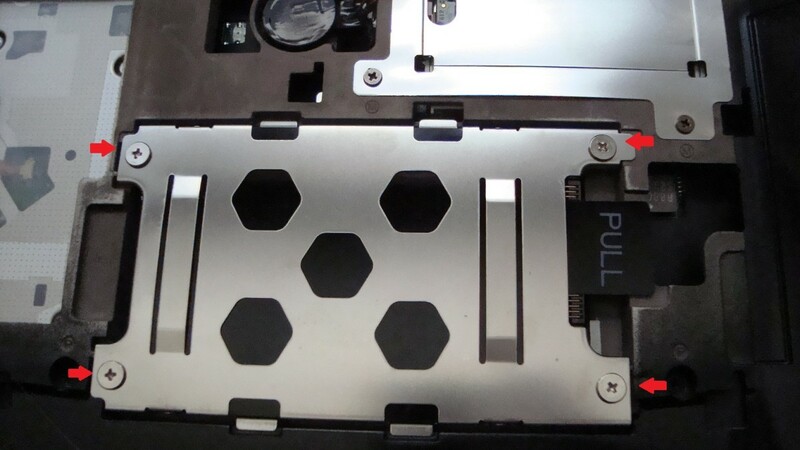 Secure the four screws that attach the caddy to the laptop but be careful not to over tighten them. Once you have seated the caddy back into the laptop you can reinstall the compartment door. The door will slide upwards towards the battery compartment and lock into place. Make sure the two screw holes line up before you replace the screws. Don't force it into place, if it doesn't slide in easily it may not be properly aligned. Replace the battery by rocking it back into the compartment, you will hear a click when it is locked into place. 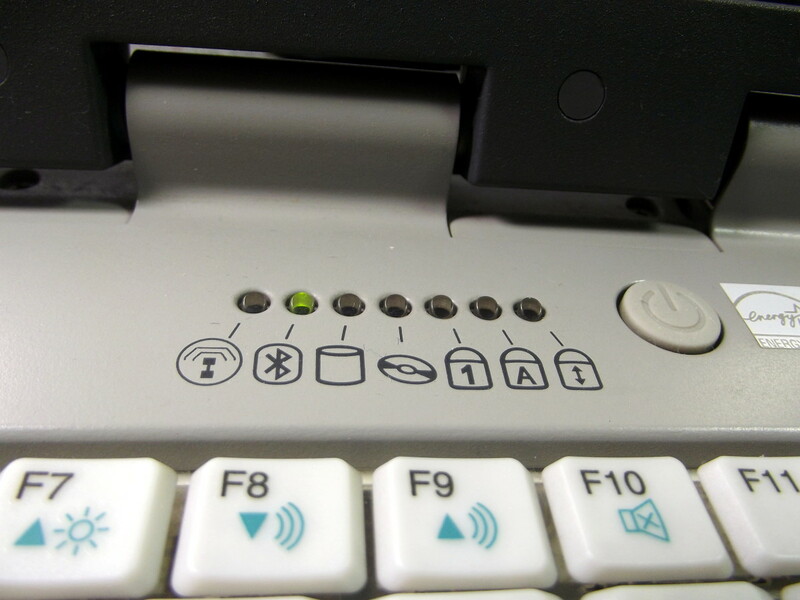 To make sure your new hard drive is detected power the laptop on and press F2 while it powers up to enter the system BIOS. On the advanced tab arrow down to the hard drive menu and press enter. You should see the model number and capacity of the new drive you just installed. If the drive is not detected make sure the drive is properly seated and re-seat it if necessary. If you cloned your old drive to the new one your job is finished otherwise you can reload Windows using the Alienware respawn disc. As you can see this isn't that difficult of a job thanks to the awesome job the Alienware engineers did designing the chassis of this laptop. If you have a different model of laptop I recommend looking for the service manual to find the instructions for removing your drive. If you found this hub useful please take a moment to rate it or leave a comment below. This is a pretty good tutorial. Lately, every one does them with a video and I hate that :P. Anyway, I followed it in order to replace my 320GB drive with a 1TB one, but when I installed windows, I could not make AlienFX work and I have to lights in the keyboard, do you know what can be done to solve this issue? 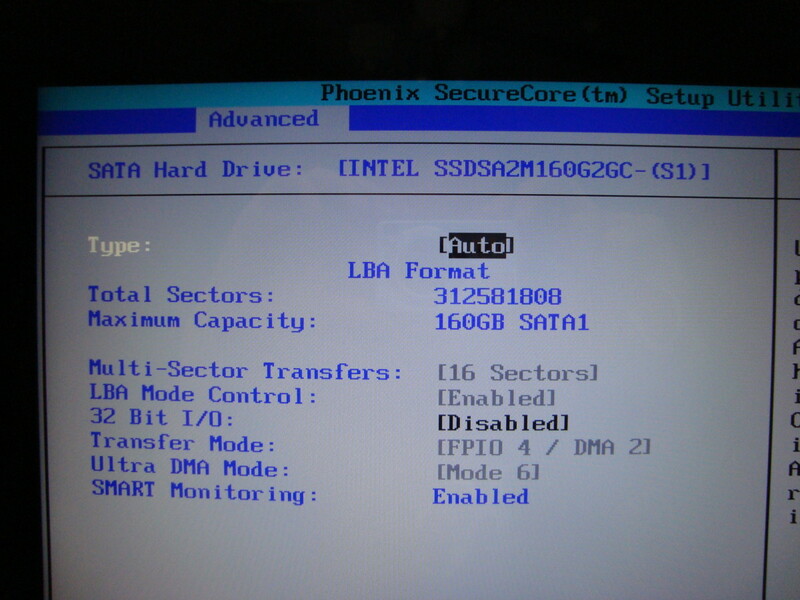 Yes, you can use any 2.5" SSD as long as it has a SATA interface, which nearly all of them do. Keep in mind that not all SSD have the same read / write speed though. If you want maximum performance make sure you purchase one that supports a fast transfer rate. Can one use any 2.5" ssd? Yes, actually it's quite common to use a smaller SSD for the OS and a larger traditional drive for storage. My desktop currently has a 160GB SSD for Windows and a couple of 1TB drives for holding everything else. The M15x only has room for a single hard drive though. The M17x is able to hold two internal drives. Just wondering if it's possible to run an SSD as a boot drive and conventional HDD for storage? You are absolutely right...Whenever I use a computer without an SSD they seem incredibly slow and unresponsive. Once the capacities are large enough and the prices drop hopefully we will be able to get rid of all spinning media. Excellent tutorial. Once you've tried an SSD, there's no way you are ever going back to a hard drive other than for storage purposes. I'm glad that you found the guide helpful Terrance, thanks for commenting! Hey Terra! Thanks for checking out my hub. Yes, SSD drives are still a bit pricey but they are slowly coming down in price. By the way, Amazon Unbox is awesome! Awesome guide - I'm upgrading to a larger capacity drive (gosh those amazon unbox movies sure have a way of multiplying!) and this guide helped a lot! Too bad SSD is so expensive still. Well, for me space is more important than performance! Thanks for posting an illustrated how-to! Awesome! Enjoy the new drive Acidbuddy. 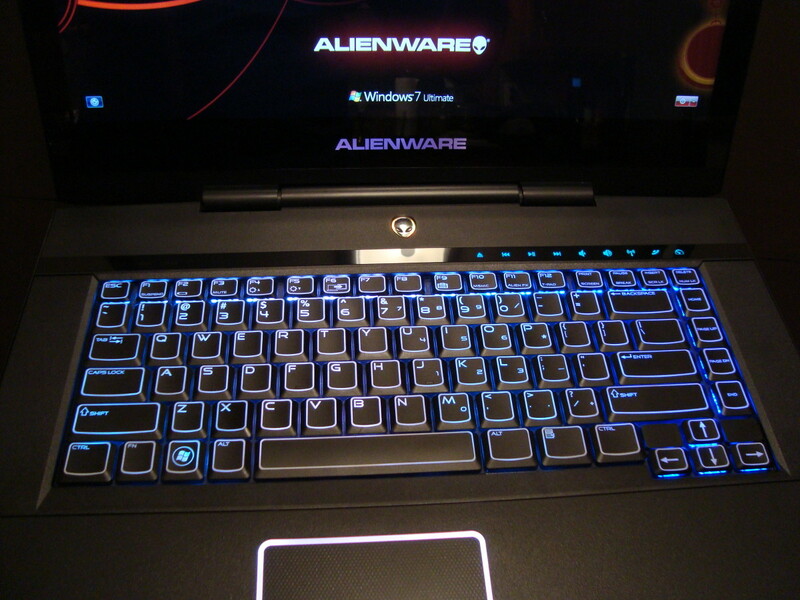 Great articles even though Alienware comes with a comprehensive manual, it is great to read online. As I am debating if I should pull the trigger for a ssd upgrade over a beer near the computer center.